When I grew up in the Mid-Atlantic there were groups of “Plain People” living in rural communities all around , in nearby Pennsylvania, Indiana and Ohio. The Amish, a sect of Mennonite, live a simple lifestyle which shuns pretentiousness and modern affectations. Although there are variations among the communities, most Amish live a quiet life where family is of upmost importance. They are known for high quality craftsmanship, especially in furniture production and style, textile skills and great food (sausages, breads, sho-fly pie). Today there are nearly 250,000 members of various sects living in 27 states and Canada, but a popular tourist destination is Lancaster County, Pennsylvania where tour buses bring visitors to the “Pennsylvania Dutch”. A sought after textile has been Amish quilts which, in times past, were made entirely by hand or perhaps on a treadle sewing machine. The colors were muted, dark and generally somber which reflected the clothing they wore…dark blue, grey, black, and sometimes dark green or brown, often with a strong accent color of fuschia, red or yellow. The designs were abstract in PA Amish. Today one must be very careful when purchasing an “Amish” quilt, as they are often factory reproductions, not vintage. One important characteristic of an Amish quilt is an “intentional mistake”, a misaligned block or small crooked seam, for they believe only God can create perfection. 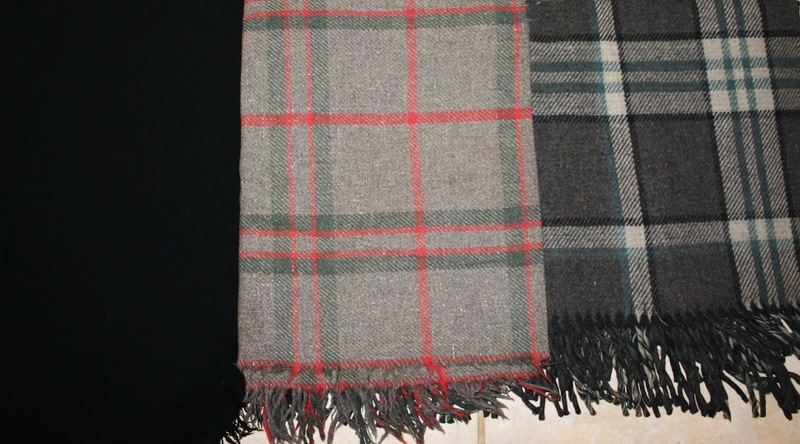 Other popular Amish textiles are rugs: braided, hooked or knit and embroidered towels. While Amish and Mennonites discouraged ornate decorations, there was approval for samplers and decorated “show” towels made primarily by young girls to demonstrate their needle skills. The textiles I present today are Amish buggy shawls. 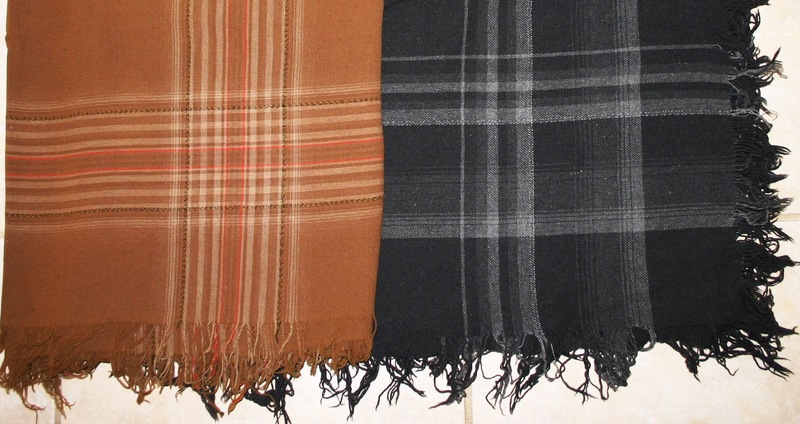 Riding in an open buggy can be chilly, even in mild weather and woven wool shawls were used as lap robes. During the winter months, they were much heavier. 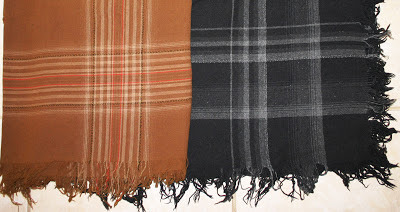 These large shawls, usually fringed, measure approximately 60x120 inches and can be found in shades of grey, black and brown, both plain and plaid design. Because they were heavily used, small tears and worn spots were repaired and it is unusual to find one in near perfect condition. Even with small defects they make lovely throws and bring a piece of history to your family.